Note: As a proud MEA member, high school teacher, and student leadership advisor, I asked two journalism students to write an article explaining a hugely successful community service project we’ve conducted in Lake Orion. Sponsored in part by our local education association, LOEA, this event focuses our students’ attention on the needs of military personnel serving on our behalf around the world, and it asks our kids to sacrifice something important to them for one day—their cell phones. In the process of unplugging our devices and giving to others, we all come together. If you would like information about setting up a similar event, contact me—Lori Hogan—at Lora.Hogan@LOK12.org. Every year since 2015, students “Cell Out” at Lake Orion High School. In January, students volunteer to turn in their cell phones for one whole school day in a service project first started by advisors Lori Hogan, Kirk Weber and Amy Redman. 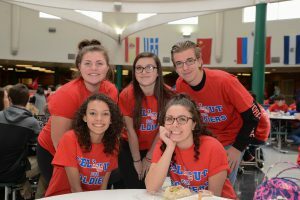 For each phone collected, the leadership class donates one dollar to a non-profit organization, Cell Phones for Soldiers, which provides free calling cards to active-duty military members to connect with loved ones. On Cell Out day, sleepy teenagers enter school and line up at tables run by students in the leadership group. Yellow slips detailing conditions of phones are bubbled in; devices are bubble-wrapped and handed over to the trusted hands of the Cell Out committee; and the teens rush to pull on their free, sponsored American-themed T-shirts. A monochromatic scene of either red, white, or blue—depending on the year’s chosen color—floods the senses as more than 2,000 students in matching shirts mingle together. Communication between everyone in the building is heightened. Leadership member Douglas Mason II said that students without phones talk more with each other about issues not often addressed on a daily basis inside the halls of a typical high school. The $4,000 raised through Cell Out in 2015 alone equated to two thousand hours—or approximately 83 days—of talk time for soldiers and their families. Lake Orion High School is the only school in the nation to do this type of project to benefit Cell Phones for Soldiers. “Everybody here is willing to participate and it’s really just an example of how good LOHS is as a school,” Mason said.